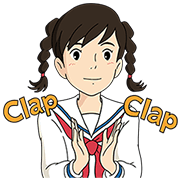 http://www.line-stickers.com/ – From Up on Poppy Hill Line Sticker | Studio Ghibli’s film From Up on Poppy Hill makes its LINE sticker debut! Umi, Shun, and the residents of Coquelicot Manor and Quartier Latin all make an appearance in this set. Relive your favorite scenes from this touching coming-of-age story.